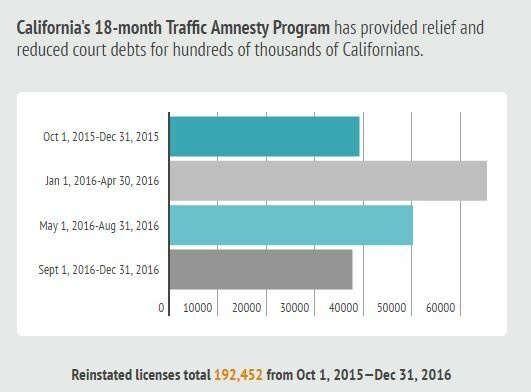 The 18-month Traffic Amnesty Program that has reduced court debts for hundreds of thousands of Californians ends April 3. 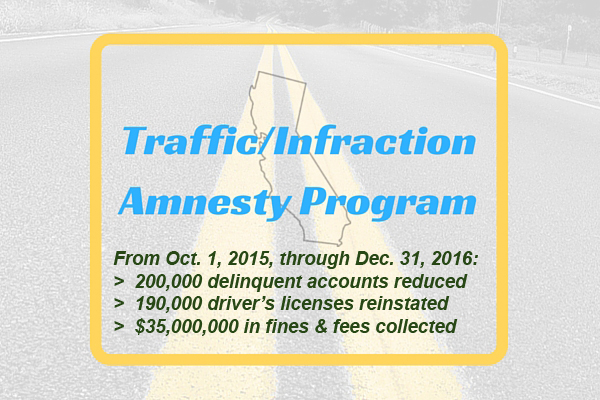 The amnesty program reduces unpaid fines and assessments on qualifying traffic tickets and non-traffic infractions. The program also provides relief for many drivers whose licenses were suspended because they failed to appear in court or have outstanding court debts. This amnesty program does not apply to parking tickets, reckless driving, or DUI offenses. More details on the amnesty program and interim reports on its progress are posted on the California Courts website. The council will post a final report on the program after its conclusion. NOTE: The statutory deadline for filing amnesty requests falls on March 31, which is a judicial holiday. By operation of law (Code of Civil Procedure section 12a. ), the deadline becomes the next court day, which is Monday, April 3.